The Oakland A’s planned new stadium at Howard Terminal adjacent to Jack London Square will be a transformational investment for the City of Oakland. Our own analysis in June 2017 found that a new downtown stadium could provide $3 billion of economic benefit to the city over 10 years—in the form of new jobs and increased spending. However, the Howard Terminal site has challenges in its transportation connectivity that can keep the stadium from achieving its transformative potential. Not only will fans need to make their way to and from Jack London Square for A’s home games and other events, planned developments around the stadium have the potential to bring thousands of jobs and new residents to the area. Without a major investment in infrastructure, these fans, workers, and residents will face travel issues for years to come. 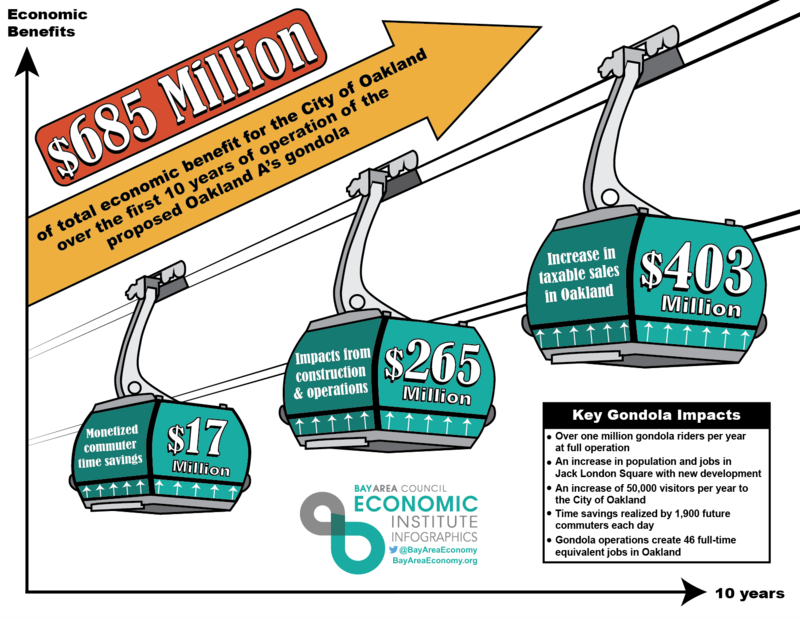 That is why the Oakland A’s have proposed the construction of a gondola system that will carry passengers from Washington St. and 10th St. in Old Oakland to Washington St. and Water St. in Jack London Square. This type of aerial transit system will bring frequency, reliability, and speed that other traditional types of transit lack. It will also create a link between BART and the new stadium and the amenities surrounding it.